News klaxon!! We now offer allocated seating complete with a responsive, interactive seat plan. 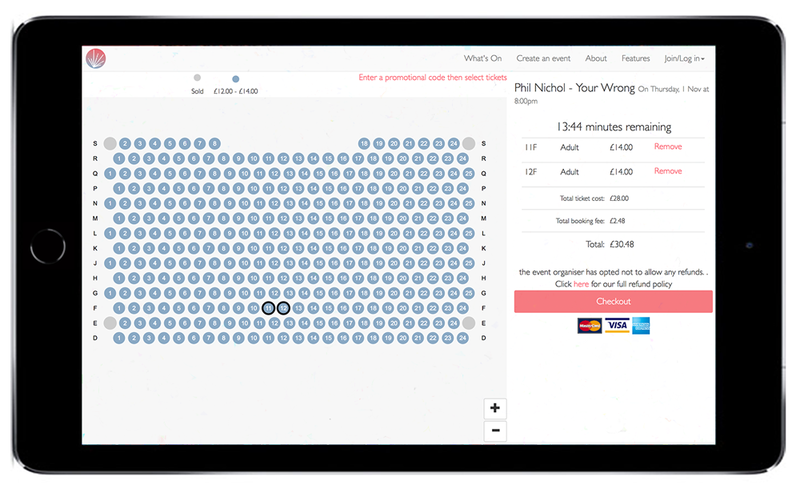 Customers are able to see the seat plan when buying tickets and choose exactly which seats they'd like, whether on desktop, tablet or mobile. We've also completely redesigned the box office so you can quickly and easily sell tickets by simply clicking on the seat(s) the customer would like. Or click on an existing sale to see the details of a sale, make changes or to check them in. If you'd prefer, you can easily switch tabs back and forth between seat plan view list view. Allocated seating can still have the same powerful pricing options as unallocated seating - each seat can have different pricing options and the seating plan is automatically colour coded so that customers can understand what price range each seat is available at. If you'd like to set up an event with allocated seating, just drop us a line at [email protected] and we'll even draw a beautiful seating plan for you.